James Bannerman Cunningham was a native of Preston Pans in Edinburgh. Part of a large family group many of whom where eminent in a wide variety of fields. He was a Doctor (Medical Surgeon Practitioner). Eugenie (nee Luke), his wife, was born in Cornwall, daughter of the owner of a Tin and Copper mine. Her brother, George Bingley Luke, was also a mine owner and moved to Edinburgh to further his business interests and Eugenie seems to have moved with him, possible to keep house. 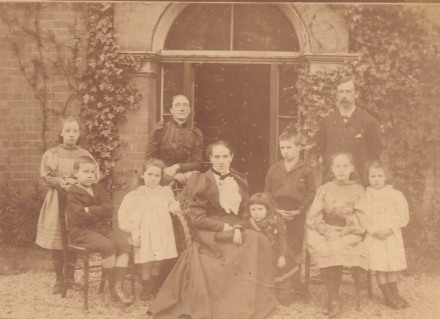 James and Eugenie married in Preston Pans on 16.09.1880 and continued to live in the area for three to four years, during which time they had their first two children. They then moved to Canada and lived in the New Brunswick area, where they had another son. For whatever reason they then moved back to Scotland and a further three children were born. Then they relocated to Tyneside where they had another son. Their life in the village is chronicled within some of the numerous letters they sent to each other and their large extended family. The letters give us a glimpse of daily life at the time of the approaching Great War. Some of their sons had returned to Canada to further their future prospects one was in Paris, and one was already a career soldier. In 1914, at the outbreak of World War One, their mother writes to Canada encouraging them to join up. Charles seems very reluctant to do so. Maybe they had just begun to establish themselves in Canada or maybe, as was thought at the time, they thought the war would soon be over. However, in the end their Mother persuaded Charles and Robert to enlist, which they did, joining the 7Th Canadian Infantry, British Columbia Regiment in 1915. On September 8th 1916 Charles was killed at the Battle of the Somme aged 19. He is commemorated on the Vimy Memorial in France and on Ruyton’s own War Memorial and on his father’s headstone in the graveyard of St John the Baptist Church. All the other brothers survived, including Bruce, the career soldier, who went on to serve in India and retired in the 1930’s, still writing letters to his family. Sadly Eugenie had already suffered another major loss when, during March/April of 1915, James Cunningham cut his arm when administrating to a patient. This started off a severe infection and Septicaemia and it was thought that his fingers would need to be amputated, and then his whole arm. But before they could operate, he died on Easter Day April 4th 1915 aged 62, and is buried in St John the Baptist Churchyard. Eugenie then sold the practice in 1917 and moved to London to live with one of her daughters. Eugenie died on April 4th 1920 exactly five years after her husband .and was buried in Croydon, London, although her name and the name of their son Charles, appear on the grave stone of James Cunningham in the Church yard . The family details are as follows. William Bruce - 1885-1969, New Brunswick , Canada. Irena White and I both have extensive family history records collected over the years, and contact details of people who are already researching local families. We would be happy to help family history searchers but please, do not arrive in the village and knock on our door. Email to the address shown on this page and we can start with some correspondence regarding what you know and what we know. We can then direct you to houses/places of interest when you come to visit the village.